MEDICATION SCHEDULES, INJURY REPORTS, TREATMENT LOGS AND MORE. 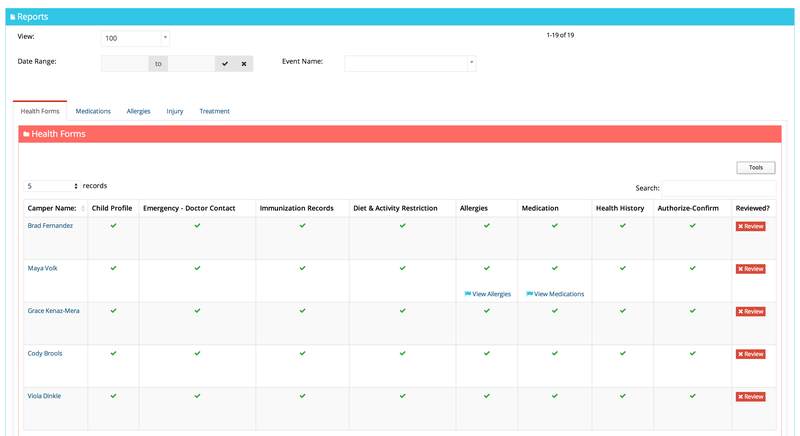 The Report Page offers an at-a-glance view of completed / incomplete health forms, camper’s allergies, medications, etc. 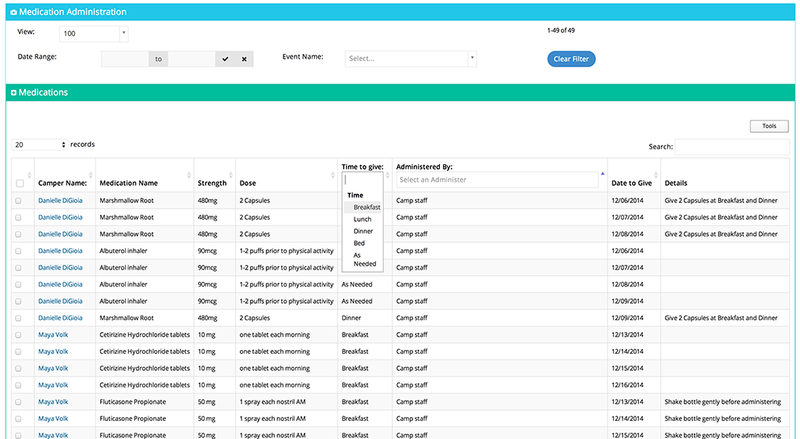 Search by camper’s name, sort campers by condition, allergy, or medication and receive a pop up window listing all campers within the defined parameters. Review camper health history by group as you plan care and camp activities, or call up camper health history, time of medication administration, and treatment logs on the fly while making care decisions. Your job as Camp Director, Nurse or Med Staff becomes infinitely easier with healthEcamper providing every camper’s secure health information mere seconds away. Countless hours go into planning, preparing for, and managing medication administration at summer camp. 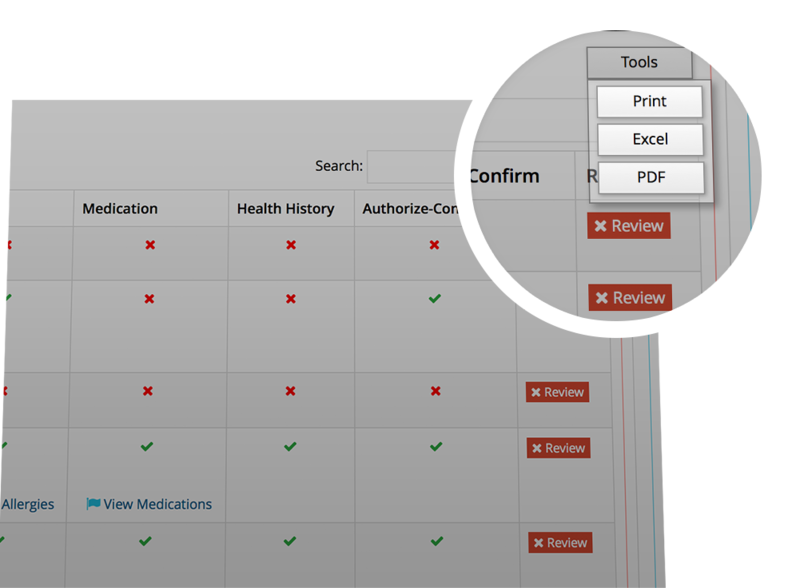 Reduce the time needed, and the potential for missed medications or administration errors with the Medication Administration component of healthEcamper. Med staff can search by camp name, date range, or time of administration and receive an interactive page with camper name, medication, dosage, Rx instructions, and documentation features. Parents who choose the opt in feature receive real time email alerts once staff complete documentation, creating peace of mind and saving your staff from avoidable interruption of camp activities. Accidents happen. Kids fall, trip, get home sick, twist a muscle, or simply need the reassurance of an adult. Quickly record treatment measures, date / time provided, supplies used and outcomes by camper. The ease of charting ensures timely intervention, and lets children proudly wear the battle wounds of summer camp. Printable reports facilitate quality control and improvement goals, and provide parents with a level of trust and comfort in the care provided at camp. On those rare occasions when an accident or illness exceeds your ability to provide care, the Injury Report feature ensures accurate and timely recording of information necessary for parents or EMS. Record care measures provided, date / time / site of injury and treatments provided. You can even include a SOAP note, ensuring continuity of care and timely interventions at the next level of care. 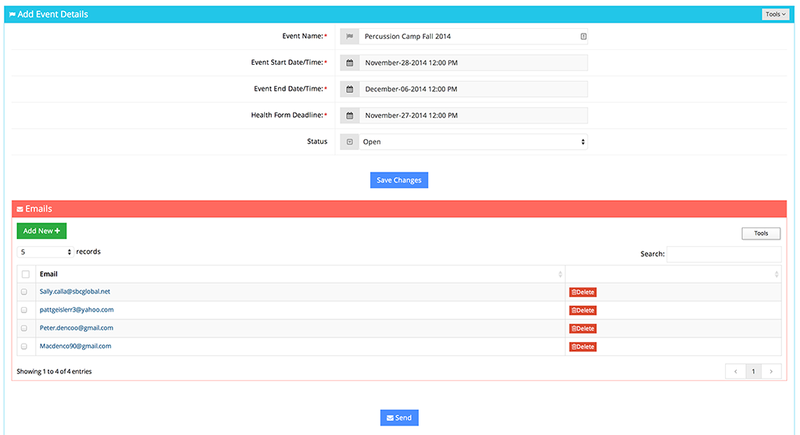 healthEcamper provides a simple, seamless camp setup wizard that allows you to set the camp name, dates of attendance, due dates for health forms, and auto-reminders. Once completed, upload a csv file containing parent contact info, and schedule welcome emails inviting parents to complete their children’s online camp health forms. 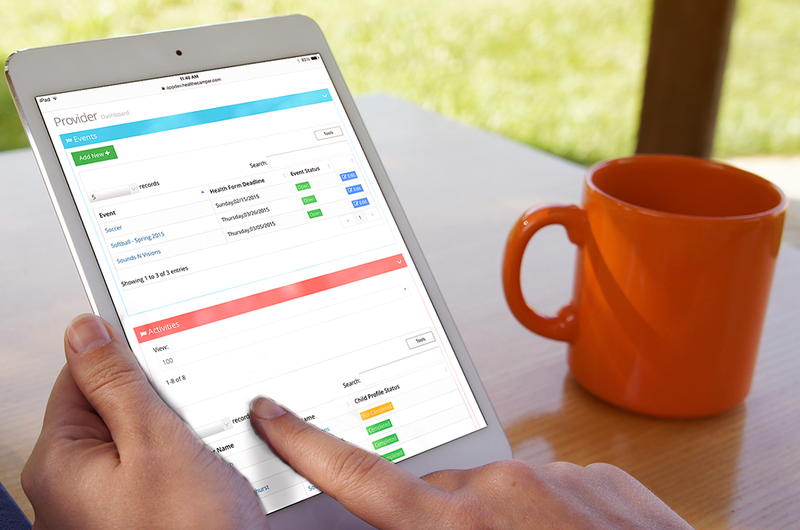 The healthEcamper Provider Dashboard places critical, realtime, camper health information at your fingertips.